Anyone visiting the state capitol who is licensed to carry concealed weapons would be allowed to keep loaded firearms in their motor vehicles that are parked near the complex. This bill overwhelmingly passed the house Thursday. Delegate Gary Howell of Mineral County cited the bill as a safety issue. House Bill 2128 passed 97 to 0. 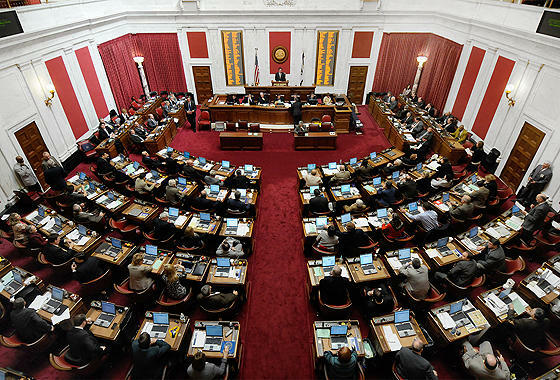 On second reading, or the amendment stage, was House Bill 2151, which would make the West Virginia teacher of the year an ex officio, nonvoting member of the West Virginia Board of Education. Delegate Doug Reynolds, a Democrat from Cabell County, stood to offer an amendment to suggest the a change in the qualifications of some members of the Board of Education. Reynolds' amendment received major support from both sides of the aisle passing 97 to 1. The one rejection vote was from Delegate Joe Statler, a Republican from Monongalia County. Currently, the Governor appoints the members of the state school board with the advice and consent of the Senate. Reynolds suggests that the Governor must consider board members who actually have school age children. He thinks it would help bring a new perspective. Reynolds says he has nothing against the current school board, but he thinks his amendment will help aim to make the school system better. With committee passage of the repeal of the prevailing wage in the Senate yesterday and that issue poised for a vote on the senate floor next week, Delegate Mike Caputo warned his house colleagues that the bill is on its way.